Beaufort History Museum - 4th Annual Beaufort History Museum Tea: The Language of Libations, Celebrating Sweet Tea, Demon Rum, John Barleycorn, And Carolina Moonshine! 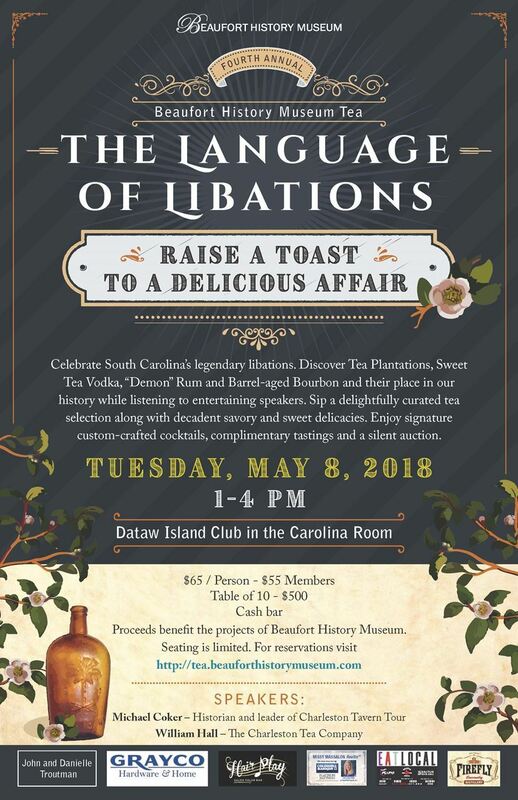 4th Annual Beaufort History Museum Tea: The Language of Libations, Celebrating Sweet Tea, Demon Rum, John Barleycorn, And Carolina Moonshine! Sorry... Registration for the Tea has Closed. Advance Reservations for the Tea are required (reservations will not be available at the door the day of the event). The deadline for making reservations is Tuesday, May 1, 2018. Please note that the Tea has sold out in prior years before the deadline, so making your reservations early is strongly advised! Please click here to read the event reservation details before making a reservation! Thank you. Cheers! Beaufort History Museum invites supporters to toast The Language of Libations at the Museum’s fourth annual Tea fundraiser. The event is scheduled for Tuesday, May 8, 1- 4 PM at Dataw Island Club.